If Gase stays Tannehill will be gone for sure I think, but if a regime change takes place I would say the new head coach would have a say on Tannehills future. So we still have to pay the piper in 2019 and maybe 2020 for Tannebaum's contract mistakes that will still haunt the team for another year or two? So many financial decisions looming. Miami will face the NFC East, AFC North, Chargers, Colts and the division games in 2019 that seems like a very tough schedule at the moment. Cool, our new QB Foles can give us scouting tips for the NFC East. Being that is reported that we are rebuilding, wouldn't it make it seem to trade back is much more likely than ever? Trade off vets for picks, clear cap space and trade back to gain more picks ala browns. If someone out there believes they can develop Charles Harris, Dolphins might be able to squeeze a 3rd rounder from someone but given this draft is so stocked with DL talent it’s unlikely. Howard, Fitz, Drake, McMillian, Baker, Tunsil and Gesecki (although he was very underwhelming for all the hype) are really the only untouchables in my opinion. Everyone else can go. Remember when the Browns didn’t win for a long long time? That’s what this could look like. There is not a QB in this draft worth drafting. For those who think Haskins is the guy, name me an Urban Meyer QB that did anything in the NFL? It took Jim Harbaugh and Andy Reid to make Alex Smith respectable..
2019 is all about the Herbert/Fromm sweepstakes. And don’t even mention Tua. Once again, name a Nick Saban QB that was worth anything in the NFL. I wouldn’t have kept Grier. I will give credit to the picks of Drake, Howard, Grant and Godscheauex. Epic fail on Harris, Parker (he was in charge of college scouting for this pick) Caroo. Robert Kraft has to love this. The Dolphins are such a circus. 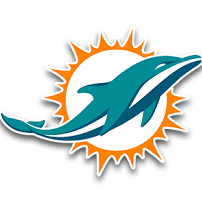 Because of Tannenbaum’s idiotic spending, Dolphins can’t move any of those contracts. True. Gonna take 2019 and possibly 2020 to recover from Tannebaum. Reshad Jones is a cancer, he's gotta go, and dang he's an expensive out. Just like Mike Wallace and Nyukkah Suh before him. Ok we wasted like 8 seasons with bad contracts. Stop the pain right here entering 2019 and get it together. Be fiscally responsible, take some chances where you can. Just don't overextend in a way that cripples the entire team roster for a couple-few years just on one guy's contract. I’ve had multiple players and people within the organization DM me petitioning for Rizzi to become the next head coach of the Dolphins. No one in our building is more well-respected than Darren Rizzi. Team could be more serious about him than they’re giving off. If you know it’s going to be 3 years before you’re truly competitive, why not give the guy a shot? The coaching pool is awful this year. When the coach you fired is a Top candidate for all other teams, you have an issue. If you watched the Grier, Ross press conference, the vision of the team was very clear. Home grown Dolphins talent will be safe, so Jones will probably stay. They did say however, that they were done with older free agents. The names kicked around right now as being immediate cuts are, Branch, McDonald, Alonzo, Quinn, Sitton, all of the DT free agents we signed this year, and Larsen. Performance based cuts will be Tannehill and Parker. I think that Amendola will be safe, due to his extreme work ethic and leadership. I also wouldn't be surprised if Wake is brought back as a situational pass rusher/team leader. Any free agents we sign will be under 30. Grier said that Miami will no longer be the final stop on a players career for one last big payday. The press conference also seemed to throw some shade at T-bomb for letting Landry go, because he is the type of home grown talent you should be spending your dollars on. The presss conference made it very clear that he Dolphins won't be the team making a big splash in free agency, we will be a draft built team. I also don't agree that all of the QB's in this class are garbage, the top QB's each have some stuff to work on, but out of Grier, Haskins, and Lock, one will be a good starting QB. We need to find out which one, and trade up to get him. If it doesn't work out, we will have a shot in 2019 as well. In fact, I would take 2 QB's this draft, because we need some competition at back up QB as well. I still love Stidham in the 4th this year. He's never had a QB on the level of Tua at Alabama. He's never needed the #1 recruit at QB because he's gotten the top 2 RBs each year, to go along with dominant O-linemen and the best defenders. A game manager capable of not turning the ball over and being somewhat accurate with the ball is all that has been needed. Tua is a luxury for Saban with his brand of football and you can see just how ridiculously dominant that team is when it gets a legit talent at the QB position. I still want the Fins to draft a QB this year. I don't care if it's in the 6th round. Take one somewhere every year until the guy is found. I saw that PFT blurb about Branch/Quinn/Parker all gone for sure. It's gonna be ugly the next 2 years, but this is what I've wanted for a long time now. No more perpetual mediocrity. Blow it up and do things the right way. Seeing how spectacular a full rebuild worked for my Cubs makes me even more excited.